Beston waste-to-energy processing plants are the best choice if you want to know how to get the available energy from garbage. Because this plant can separate a variety of materials (such as plastic film, paper, metal, glass and others) from the municipal solid waste. Its greatest usage is to convert the waste to energy for our daily use. We all know there are many useful things in the municipal waste. However, only a few countries can effectively recycle the waste by category. For the countries which don’t have restrict consciousness on classified garbage recovery, it is an excellent way to use waste-to-energy processing machine. Beston waste to energy sorting plants are designed based on the principle of the reducing the volume and converting waste to the available energy. Using a variety of selection method, we could get organic, plastic, metal, brick, stone, etc. from the garbage with high efficiency. 1. The garbage will be sent to the feeding platform. Beston feeder has the special function which the waste can be distributed evenly on the feeder. This function helps to make the next process more smooth. 2. Then, the garbage enters into several sorting devices, like the rotary screening machine, magnetic separator and comprehensive winnowing machine. These pieces of equipment adopt the different advanced sorting technology. Dealt with by the combined sorting methods, we mainly get four kinds of waste which can be reused. 3. After sorted by Beston sorting machine, some waste can be directly sold to other industry after packed, such as metal. Besides, some materials can be further processed to the new product, including plastic, organic matters and construction waste. Also, we Beston Machinery provide some reprocessing machine for you if you have this need. 1. Manual and automatic switcher and emergency stop device. Every part of the system is equipped with manual auto switcher and emergency stop device. It locates in easy operation position to avoid error starting or electrocution. 2. Smoothly conveying system. The whole feeding process is even because of reasonable connecting design for every transition point. Therefore, these wastes are distributed without accumulation. 3. Updated system. This automated sorting system is upgraded by our experienced engineers. Accordingly, this system consumes less power than traditional ones. It needs less manual operation and has the higher degree of automation. In addition, it has no noise. 4. Customized design. It can be equipped with different size of blade or hole in the rotary screening machine. It is totally depending on the customer’s requirements. We believe you have done some investigation before doing converting waste to energy business. The following analysis will give some suggestions for you. 1. Environmental project. Waste-to-energy processing plant is a green project which is distinguished from the traditional project. Firstly, the sorting process is fully sealed. There won’t generate pollution to air or the workshop. Secondly, this plant equips with special deodorization system. This system can effectively eliminate the odor the waste spreads. Accordingly, the health of workers will be guaranteed. 2. Profitable municipal solid waste plant project. Firstly, the environmental programme is a general trend for all countries. Its potential market is huge. Secondly, the resources are scarce in the global world. Recycling the waste is a great disposal method for reusing these waste. And the waste cost is cheap. The profit margin is high. Consequently, what are you waiting for? Before you set up this plant, you need to know the following costs you can’t be ignored. 1. Machine cost. The garbage separation machine is the foundation for setting up a plant. When talking about the machine price, many customers will concern whether the price is reasonable. We Beston Machinery make sure that the price we offer is affordable. If you are keen to know more details about price, don’t hesitate to contact us right now. 2. Raw material cost. We always see the waste around us. They mean useless for human so that they are abandoned. Accordingly, there is a wide range of source to get the garbage. And the garbage cost is so cheap. It is an insignificant cost for you. 3. Labor cost. This sorting system adopts several advanced sorting ways. Therefore, the sorting rate and the automatic degree is higher than other sorting machines. Then, it is unnessary for you to employ large labor. In other words, it will help you to save labor cost. 4. Maintenance cost. If waste-to-energy processing plants want to run normally, it needs regular maintenance. The regular maintenance is conducive to prolong the service time of machines. Accordingly, customers should pay a attention to the regular maintenance. 1. 24-hour uninterrupted service online. If you have any question, it is available for you to contact us at any time. We warmly welcome your quotation! 2. Technology guidance. Maybe you are not familiar with this technology. This problem won’t interrupt you. Because we have professional personnel to reply to your question. 3. Turnkey project. Do you want to make profits? Are you expecting that others set up a trash processing plant for you? This can be realized! We Beston Machinery provide turnkey project service. All you need to do is giving your information and requirements to us. 4. Installation at your site. Installation is not an easy work for customers. If you still have some place unclear and can’t install by yourself, we Beston Machinery will dispatch our experienced engineers to your site. These engineers will assist you to install and debug the machine. Providing training is also available for your workers if you have this need. 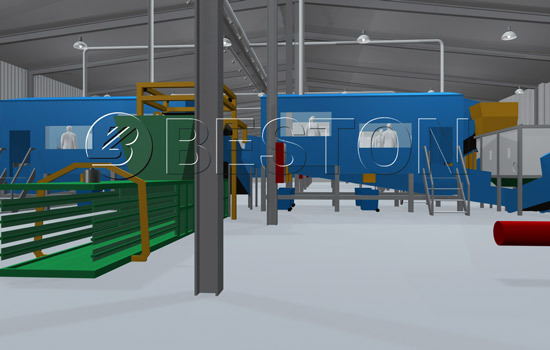 Are you interested in Beston sorting machine? Email us to get the detailed information!